We all travel whether it's to a race, a ride, or without the bike. 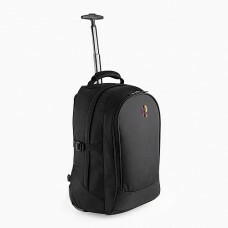 Our range of luggage is ideal for all modes of transport and all comes with pop out handles and wheels to save carrying it on your back. Embroidered with a small 'e' logo to make sure you can find it on the luggage rack or carousel. The ideal bag for where you need reduced amounts of kit or as a flight bag for holidays or training .. The perfect kit bag for races, weekends away, holidays or training camps. Retractable tow handle and..